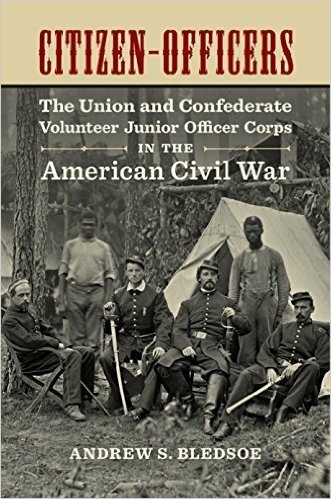 Citizen-officers: The Union and Confederate Volunteer Junior Officer Corps in the American Civil War, Andrew S. Bledsoe, Louisiana State University Press, 352 pp., ten illustrations, ten graphs, three charts, bibliography, index, hardcover, $47.50. From the Publisher: From the time of the American Revolution, most junior officers in the American military attained their positions through election by the volunteer soldiers in their company, a tradition that reflected commitment to democracy even in times of war. By the outset of the Civil War, citizen-officers had fallen under sharp criticism from career military leaders who decried their lack of discipline and efficiency in battle. Andrew S. Bledsoe’s Citizen­-Officers explores the role of the volunteer officer corps during the Civil War and the unique leadership challenges they faced when military necessity clashed with the antebellum democratic values of volunteer soldiers. 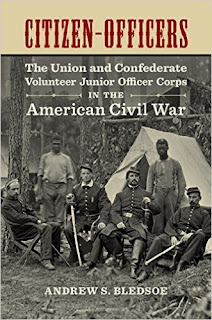 Through an analysis of wartime writings, post-war reminiscences, company and regimental papers, census records, and demographic data, Citizen­-Officers illuminates the centrality of the volunteer officer to the Civil War and to evolving narratives of American identity and military service. Andrew S. Bledsoe is assistant professor of history at Lee University. From the time of the American Revolution, most junior officers in the American military attained their positions through election by the volunteer soldiers in their company, a tradition that reflected commitment to democracy even in times of war. By the outset of the Civil War, citizen-officers had fallen under sharp criticism from career military leaders who decried their lack of discipline and efficiency in battle. Andrew S. Bledsoe’s Citizen-­Officers explores the role of the volunteer officer corps during the Civil War and the unique leadership challenges they faced when military necessity clashed with the antebellum democratic values of volunteer soldiers. Through an analysis of wartime writings, postwar reminiscences, company and regimental papers, census records, and demographic data, Citizen­-Officers illuminates the centrality of the volunteer officer to the Civil War and to evolving narratives of American identity and military service. “The Free State of Jones” on Film: A Q&A with Victoria Bynum, Megan Kate Nelson, Society of Civil War Historians homepage website, March 2, 2016. 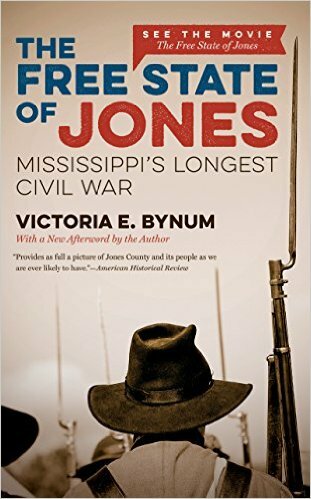 This May, STX Entertainment will release the film Free State of Jones, which tells the story of the Knight Company and the Jones County rebellion, a Civil War history first told by Victoria Bynum in her 2001 book The Free State of Jones. A few weeks ago, Bynum and I discussed her experiences working as a consultant on the film, and seeing her book come alive on the screen. MKN: Did you know at the time you were writing “The Free State of Jones” that it had cinematic potential? And what is it about this story that makes it compelling for filmmakers? VB: As I researched and wrote The Free State of Jones, I grew increasingly aware of its historical importance as an insurrection that combined elements of class, race, gender, and kinship that, for this story, had long been underestimated, misunderstood, distorted, or simply ignored. Although I did not write the book with a movie in mind, the story’s vivid real-life characters, its oral and written first-hand accounts of fierce confrontations between Confederates and deserters, the interracial romance between the band’s leader, Newt Knight, and his slave accomplice, Rachel Knight, and the Unionist core of the band itself, convinced me of the story’s cinematic potential. rolina Press, I advised the press to consider presenting the book “to television and film companies as a potential docudrama or miniseries.” At that point, however, I did not anticipate Hollywood’s interest in the story. MKN: As the process of transforming the book into the film got underway, what was it like to experience the subjects and arguments in your book morphing into a visual format? VB: When I visited the movie set in Louisiana, I watched actor Matthew McConaughey recreate Newt Knight’s pivotal experiences at the battle of Corinth. I was pleased at the manner in which Gary Ross, director and author of the movie’s screenplay, targeted the beginning stage of Newt’s evolution into a class-conscious opponent of the Confederacy, and I was impressed by McConaughey’s ability to immerse himself in the role, both physically and psychologically. I’ve since viewed the movie’s trailer, and was likewise impressed with the way in which class issues, front-line participation by women, and collaboration between deserters and slaves in this home front insurrection came to life on the screen. I’ve not yet seen the entire movie, so can’t comment on the completed product. Based on what I have seen, I’m hopeful that the movie captures the essential elements of defiance and struggle that drew me to the story. MKN: Was there anything that worried you, or surprised you about that process? VB: Like most historians, I worried about the movie’s factual accuracy. Over time, my thinking has evolved on the creative differences between an academic work of history and a historically-based movie. Both rely on imagination, but in very different ways. Historians don’t merely assemble facts, apropos the cliché, “let the facts speak for themselves.” We must use imagination as well as intellect to assign the elusive truth of meaning to our work, or we risk producing little more than a footnoted list of facts. In contrast to historians, Hollywood moviemakers use imagination to recreate a historic event that can be viewed within the space of 2-3 hours. The larger truth of an event is typically delivered without perfect adherence to facts—but rather with invented dialogue, composite characters and compressed events—to tell a true story that informs, inspires and entertains. My expectation is that the movie and my book will mutually reinforce the larger truth of about the Free State of Jones. 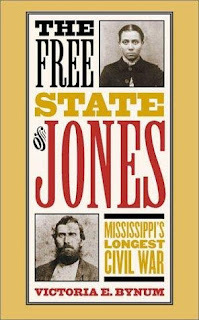 MKN: You published “The Free State of Jones” in 2001; why do think that the time is finally right — in 2014-5 — to make it into a film? VB: Actually, I first learned in 2005 that plans for a movie based on the history of the Free State of Jones were underway. As is often the case in Hollywood, the journey to production was a slow one. That said, Hollywood’s current interest in portraying Civil War dissenters is well-timed to highlight issues being debated with particular force in this national election year. Federal vs. state power, stark economic inequality, and fierce confrontations over racial, class, and gender rights all divide Americans. Amid these battles, the popularity of the Lost Cause defense of the Confederate flag as a symbol of “white heritage” has spiked, particularly on social media. The Free State of Jones reminds us that there was neither a Solid (white) South during the Civil War era, nor a monolithic white heritage embodied by the Confederate flag. MKN: How do you hope the film will shape Americans’ understanding of Civil War history? VB: Most Americans know little to nothing about landowning, nonslaveholding white Southerners of the antebellum and Civil War South, which in turn prevents them from fully understanding the average Southerner’s experience of the Civil War. In bringing the story of the Free State of Jones to the masses, not only is the image of a white Solid South negated, so also is the agency of Southern dissenters during the era of the Civil War and Reconstruction asserted. This represents an important shift in the general manner in which Hollywood has presented the Civil War. MKN: What advice do you have for historians writing with an eye toward film adaptation, or working as consultants on films about history? VB: Since I did not write The Free State of Jones with such an eye, my remarks are speculative. I’ve heard it said that authors who intend to pitch their work to film companies should retain the intellectual rights to their manuscripts (which, in academia, are generally held by the press). I suppose one would consider hiring a literary agent, as well. In the aftermath of having the rights to my book purchased by a Hollywood studio, however, I have benefited from the University of North Carolina Press’s commitment to publishing a new edition of the book and marketing it internationally. I have no specific advice in regard to finding work as a film consultant. I was asked to be a consultant for The Free State of Jones movie on the basis of my book of the same name. Several other historians were hired as consultants based on their works on related historical topics. Victoria Bynum is Distinguished Professor Emeritus of History at Texas State University, San Marcos. A graduate of the University of California, San Diego, an award-winning author and NEH Fellow, she has produced cutting-edge scholarship on gender, race, and class relations in the Civil War Era South for more than thirty years. Her blog, Renegade South, features unruly women, mixed-race families, anti-Confederate guerrillas, and political dissenters.